When the IPC originally formed their Code of Practice was quite progressive. The Prankster compared them favourably to to BPA in this blog. No doubt this conrtibuted to the DVLA awarding them provisional ATA status. Since then the BPA have made large steps to become fairer to the motorist. The IPC on the other hand, did a Jekyll and Hyde as soon as they were awarded full ATA status by the DVLA. Following that date their appeals service has become a joke, serving up institutionally biased results with poor understanding of parking-related and consumer law. Operators are allowed to submit false evidence and the IPC turn a blind eye. The IPC's true colours have emerged with the release of the latest version of their code of practice. It is worth comparing point by point with the previous version to show what happens when a rogue ATA is allowed to change its code without input or control from government. detailed further in Schedule 4. The audit no longer takes place before the member joins, but up to six months afterwards. This means the member has up to six months to operate without audited signage contracts and correspondence templates. At least two court cases taken out by IPC members have failed because the operator could not show a valid contract with the landowner was in place. Complaints are not now always investigated. The Prankster has informed the IPC of several of their operators who breach the code of conduct. The IPC has refused to investigate. This can be contrasted with the behaviour of the BPA. When The Prankster informed the BPA that UK PC were forging timestamps the BPA were reluctant to believe their members could do such a thing, but still investigated anyway. The IPC, according to their actions, are happy for their members to get away with whatever dodgy practice they like. The requirement to have accurate ANPR has been removed. ensure that such confirmation is made available to the IPC during any audit or upon request. The requirement for sub contractors to be familiar with the code has been removed. may monitor compliance with the Code and any applicable laws. 5.3 Failure to provide any such document(s) within 14 days will be treated as an issue of noncompliance under the Sanctions scheme. The requirement to allow data protection compliance to be checked has been removed. regarding the issue of the charge. you regarding the issue of the charge. It is believed this change is so that operators do not have to allow keepers the right to appeal. This is analysed later. This protection has been removed. received and how payment can be made. further action such as debt recovery or court action. the site before any enforcement action is taken by you or your agents. Enforcement action can begin during the grace period. Later on, when the notice to keeper arrives, the right to appeal is no longer present. The right of a keeper to appeal is a fundamental protection. It was a clear condition of government that the motorists should have access as a condition of the Protection of Freedoms Act Schedule 4 going live. The Prankster believes that ATA status should be removed from the IPC until the right for keepers to appeal has been restored. Signs must, where practicable, be placed at the entrance to a site. Signs should, where practicable, be placed at the entrance to a site. Entrance signage is no longer mandatory. A large number of IPC members do not bother with entrance signage. Standardised entrance signage is an important part of car park management, alerting motorists that terms and conditions apply and so they must look out for further signs. Doing away with this requirement boosts parking charge numbers and increases revenue for operators. This is another huge retrograde step by the IPC, and shows their intention is not to provide a true car park management service, but to catch motorists out in order to make more money for their members. that will provide the legal foundation to any charge. This requirement has been removed. The use of standard wording helps motorists. approach speed of traffic. You should have reference to the table below in calculating the text size. on the sign but should not detract from the prevalence of the Group A and Group B text. the sign which is not intended to be read from a moving vehicle can be of a much smaller size. motorist in relation to the sign. The definition of text size has been removed so that members can use whatever size they like. Large numbers of IPC signs have tiny fonts containing onerous terms and conditions. Allowing their members to hide conditions like this boosts revenue at the expense of motorists. One of the IPC's biggest customers is Excel Parking/Vehicle Control Services whose signs routinely fail these requirements. At one of their biggest money spinners, Liverpool Airport, the font size is 30mm instead of the previously required 120mm. It is of course, unreadable from a moving vehicle. Upsetting Excel would be a bad move for the IPC so it is a reasonable guess that this change was a result of a request by them. there is not sufficient ambient lighting, it should be made of retro-reflective material meeting BS EN 12899-1:2007 class RA2 or higher (BS EN 12899-6:2012 class P3 or higher). Dark-coloured areas need not be reflective. You need to ensure that all signs are readable during the hours of enforcement as they form the legal basis of any charge. If signs cannot be read then resulting charges that depend upon their content will not be enforceable. during the hours of enforcement as they form the legal basis of any charge. The requirement to conform to standards has been removed. The pesky condition that unreadable signs cannot be enforced has been removed. the attention of the motorist. The requirements for repeater signs have been relaxed. to the likely speed that the vehicle will be travelling at that point. the person who it is aimed at. These safeguards have been weakened. conditions/charges apply. The signage should be in addition to the signage ordinarily required. The requirement has been weakened. not it assists in resolving issues with the operator, invoke compliance measures where appropriate. 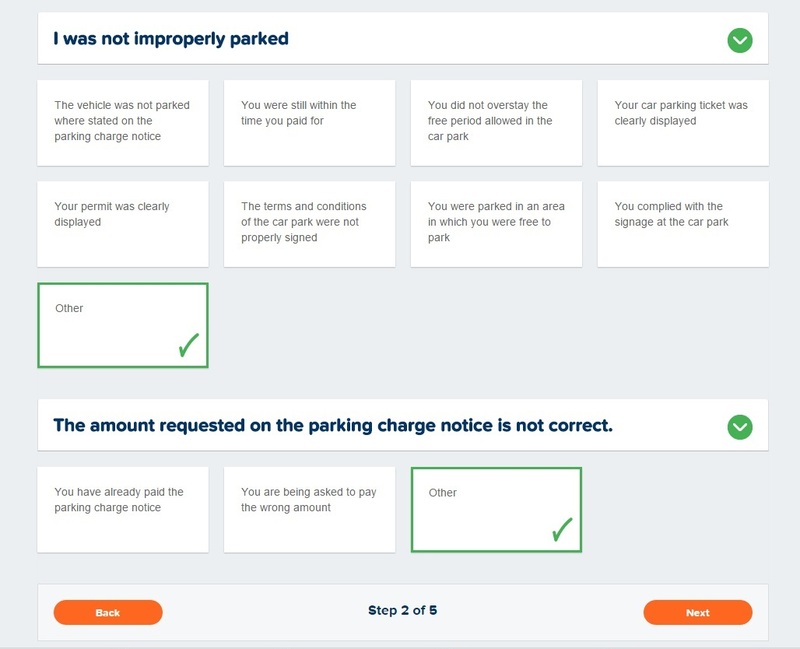 Each year the IPC will randomly select 20-50 Parking Charge Notices issued by an operator to check with compliance with the relevant legislation and the Code of Practice. The requirements have been weakened. they agree to pay a fixed fee by way of damages to the operator. This is based on a genuine preestimate of loss that flows from the breach of contract by acting otherwise than in accordance with the terms of the agreement the motorist entered into when deciding to park. All parking charges must be reasonable. However, if the motorist uses the land in breach of the terms and conditions they thereby agree to pay a fixed fee by way of damages to the operator. The requirement to be a genuine preestimate of loss has been removed. Parking charges noi longer need to be reasonable. It is obvious that every change has been made to the detriment of the motorist and without good reason. This is what happens when the DVLA allows a rogue ATA to have full control of its code of practice. The Prankster therefore backs the BPA's call for a single industry-wide code of practice, maintained by an independent body. Until the IPC gets its house in order and reverts back to a fair code of practice, restoring at least signage requirements, and the ability for keepers to appeal, the DVLA should suspend its ATA status. 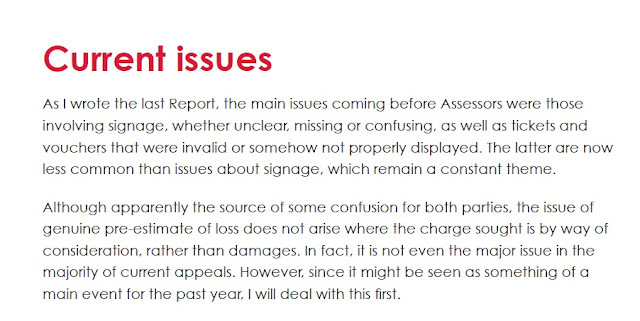 The lead assessor of POPLA, Henry Greenslade has filed his last report, which is available on the POPLA website. Although Mr Greenslade and The Prankster have not always seen eye to eye, The Prankster tips his hat to Mr Greenslade one final time for a job well done under very difficult circumstances and for withstanding huge pressures from the operators to change the basis on which POPLA operated. The Prankster has been given permission to quote from the report and believes one section needs highlighting in its entirety. During the last month we received complaints and indeed a number of press enquiries about one particular operator. A formal complaint was also made to the ISPA. This involved allegations that parking charge notices had been improperly issued in certain car parks, based on allegations relating to the time stamping of digital images. Following the formal complaint, and without making any findings whatsoever, I temporarily suspended determination of appeals from that company and asked them to provide me with an explanation. After some days the company indicated that they had checked all pending appeals and there were only five that they wished to discontinue, effectively offering no evidence. In fact, one had been decided, having been allowed the previous month, and one had not been registered. The other three were formally allowed and I directed that appeals could therefore continue. Unfortunately, within a short space of time it appeared that another appeal we had received was at the same location and, on the face of it, the same issues were present as in the disputed cases. I therefore informed the operator, the BPA, and the ISPA that I would have to again suspend determination of the company’s appeals until I received a further explanation. None has yet been received. Additionally, as I write this, it is reported that the Driver and Vehicle Licencing Authority (DVLA) have suspended access by the same operator to the vehicle keeper data that the Authority holds. 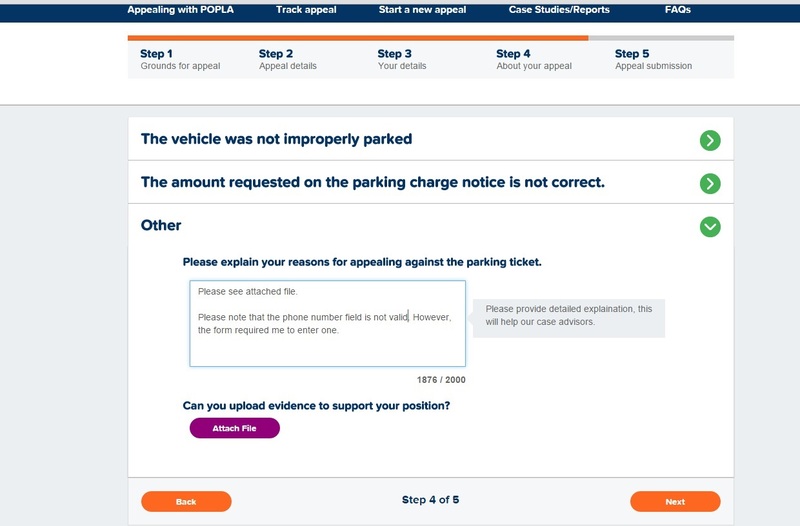 The effect of this is that the operator will not be able to obtain details of the registered keepers of any vehicles which are the subject of parking charge notices that the operator has issued. It is time for UK Parking Control to come clean and admit the full extent to which the timestamp scandal extends. There are other important issues mentioned in the report. None of the staff of the current POPLA service will be transferring over. It also appears that the new service may not use the same lawyer based appeals service, which may cause issues in the future. The Prankster will reserve judgment on the quality of decisions until sufficient information is available. The IPC appeals service the IAS have made this fundamental error. The service has been set up to apparently decide for the parking companies no matter what. The Prankster has seen a large number of fatuous decisions by the IAS 'baristas' and it is interesting to note that when the flaws in the decision are pointed out to the parking company, they crawl back in their hole and apart from sending a few meaningless debt collector letters have so far failed to attempt court action. This is hardly surprising given the quality of decisions; for instance, IAS assessors have frequently failed to understand the requirements of POFA 2012, and have ruled it applies even when the Notice to Keeper is manifestly deficient. The operators are of course more canny, and will know full well their NTKs are not compliant - in many cases because POPLA told them before they defected to the IPC. The IAS also refuses to take into account European Court cases, even though these are binding on lower courts in England and Wales. A telling fact which underlies the institutional bias of the IAS is the fact that it will not allow appeals where the motorist is guaranteed to win. The IAS will allow appeals in Scotland, but only from the driver. The keeper is not allowed to appeal. However, the parking companies are in many cases pursuing the keeper when they are not the driver, leaving the keeper no avenue for appeal. In Scotland, keeper liability does not apply, so it is a cast iron winning appeal point to truthfully state you were not the driver. The IPC refuse to allow keeper appeals for that reason; however, no Scottish court will find for the parking operator if the defendant truthfully states they were not the driver. This is equivalent to the IAS trying a murder case and finding the defendant guilty because although the defendant had a cast iron alibi, they could not tell the court who the murderer actually was. Obviously any appeals service run on these lines is not fair or independent. No doubt they will be bringing back ducking stools and witch trials next. 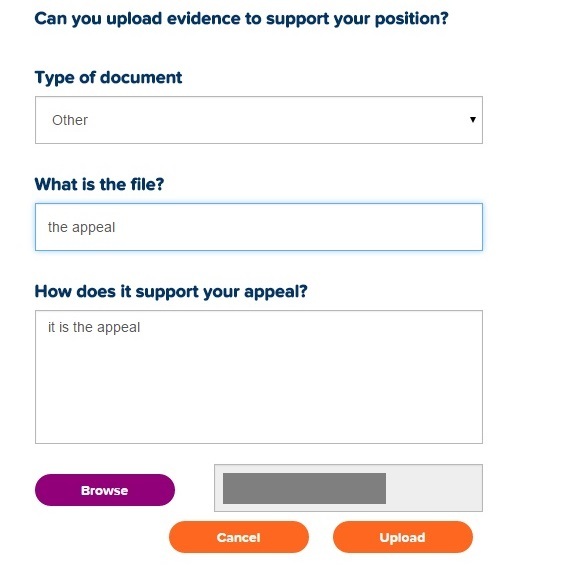 Another issue is the large number of cases which are currently suspended until the result of the ParkingEye v Beavis case from the Supreme Court. The cases are held over until November 1st. They will not now be decided on by the old POPLA team, as they will all have departed. The new POPLA service will also not be deciding on these cases. These cases will therefore be left in limbo until the BPA decide what to do with them. Mr Greenslade raises the issue that signage is a common theme. While POPLA correctly considers signage must be visible to the motorist this is not the view of the IAS. In the IAS view, any signage at all is considered sufficient, no matter how inaccessible to the motorist, no matter whether different signs are present giving conflicting terms, and no matter whether signs contain contradictions such as forbidding all parking, and then offering parking under contractual terms. The Prankster takes the view that if the parking company want to charge a large amount of money for infringing conditions, the signage should be bang in your face so the motorist is absolutely aware of the conditions of parking.Onerous terms should be in the largest font on the sign, and not hidden away in small print. Mr Greenslade raises concerns about charges in hospitals. The Prankster will blog substantially about this in the near future. The Prankster also tips his hat to the outgoing POPLA assessors and administration staff. We didn't always agree. But we mostly did. PS Who was the mystery blogger? Civil Enforcement Limited Criminal Case proceeds in Aberdeen. Threatening letters continue. The case is number 26, and the court number is 3. This will be most likely another short hearing. The actual case is due to be heard over two days in the new year. The court action does not seem to have stopped Civil Enforcement Limited sending out threatening letters to keepers in Scotland, as per this thread on pepipoo regarding an incident at Irvine. QDR Recoveries is a trading name of QDR Solicitors Limited, who are a wholly owned subsidiary of Wright Hassall LLP. Aberdeen Trading Standards might therefore be interested in adding Wright Hassall et al to the list of defendants. Wright Hassall are well known for threatening litigation on behalf of their client ZZPS Ltd. However, ZZPS Ltd are just a debt collector and have not been assigned the debt by Civil Enforcement Limited. It is no therefore clear what right Wright Hassall have to instigate any claim or to transfer to their 'legal partner'. The new POPLA process is much speedier than before. Previously the motorist received a confirmation email from POPLA giving a provisional assessment date 35 days in the future. 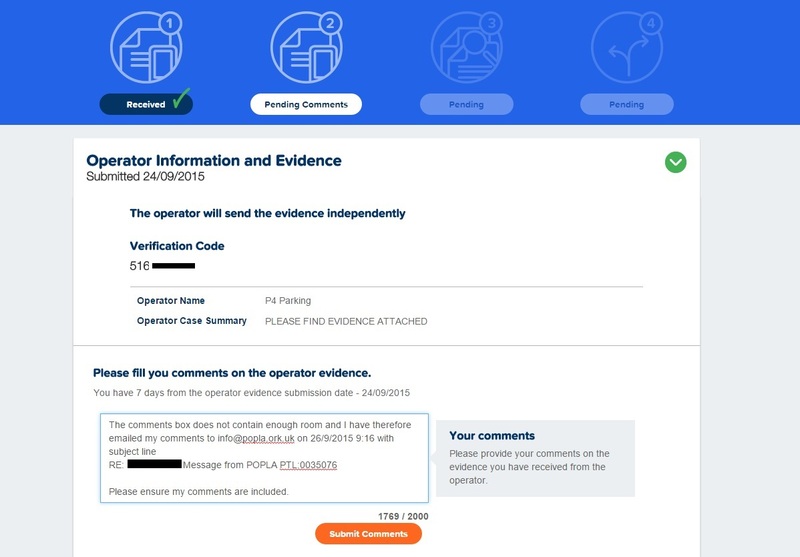 The new process is that the operator has up 21 days to submit their evidence. However, as soon as they have done this the motorist is emailed to let them know the evidence is available. The motorist then only has 7 days to reply. After that, the assessment occurs. In case the email is lost or goes into a spam folder, the motorist can also check the POPLA site to see progress. This means that motorists who go on holiday or are away for work purposes may miss out on the evidence if they don't have internet access. There is no information on what to do in such situations. The Prankster suggests you email info@popla.co.uk to request a stay. It appears some operators are not clued up on the new POPLA process. 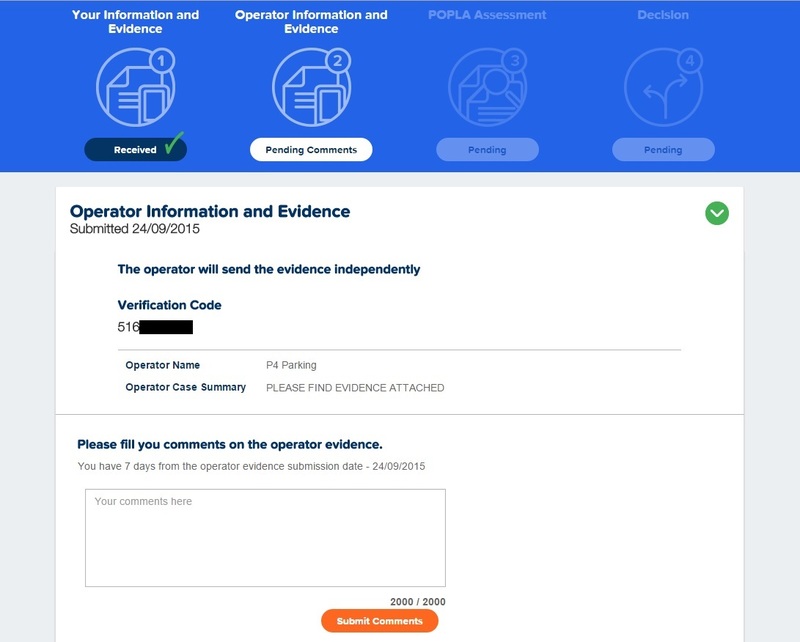 The eventual intent is for the operator evidence to be available for download on the POPLA portal. This will be a great improvement both for motorists and operators. However, this has not yet been implemented and so the operator must still send the evidence directly to the motorist. Some operators are only sending the evidence to POPLA and not to the motorist. 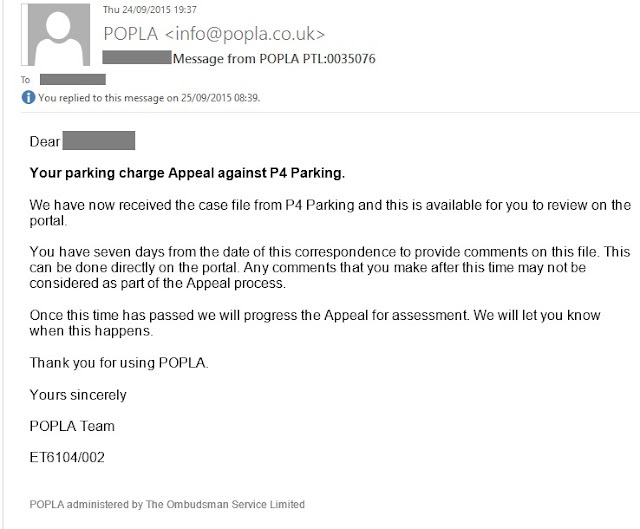 As P4Parking had not sent the evidence to the motorist The Prankster emailed them to request a copy. They refused, stating that the evidence was available on the POPLA website. After an application of the BPA cluebat, the evidence duly arrived. The British Parking Association confirm they will be contacting their members to remind them that for the time being evidence should still be sent to the motorists. The motorist can then fill out their comments on the operators evidence. The comment box only allows 2,000 characters and there is no facility to attach files. As The Pranksters comments were more than 2,000 characters and there were no instructions on what to do in such situations, the Prankster emailed his comments to POPLA and filled in the comments box referring the assessor to the email. The case then moves to the 'Assessment in progress' status. At this point the wait will hopefully be short, but this will depend on the assessor's workload. So far, the process has taken 12 days to get to the assessment point, rather than the 35 days need by the old POPLA process. The process could have taken 10 days if P4Parking had sent the evidence packs correctly. The process also means the operator apparently does not get to see the motorist's comments on their evidence. This will remove the ability for some operators to delay the process by continually replying to motorist comments. 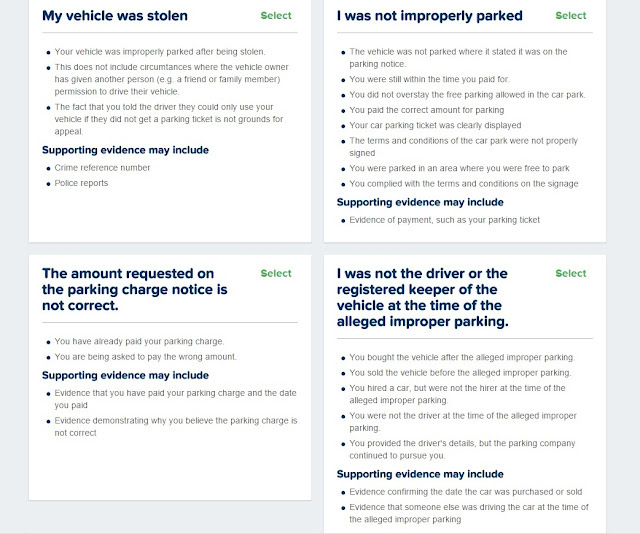 ParkingEye have been caught out yet again issuing tickets for one long stay when a motorist actually visited twice. The Yorkshire Evening Post have the full story. 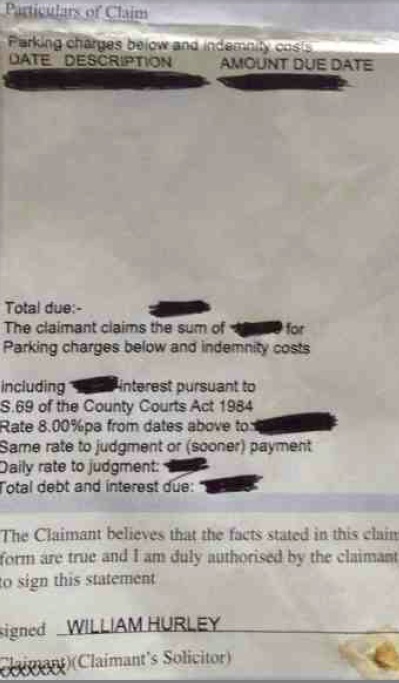 ParkingEye regularly tell the courts that this kind of thing cannot happen because of the 19 checks they make. 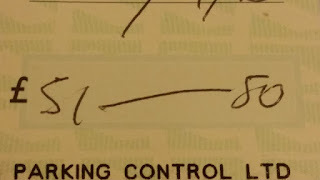 However, they never reveal exactly what these checks are, leading to the reasonable belief they are as much use as a Volkswagon emissions test. In this case the motorist visited the park in the morning to do some shopping and in the evening to buy a coffee. ParkingEye initially refused to cancel the ticket and only acted when the Yorkshire Evening Post intervened. At this point they admitted their systems were faulty and could not cope with the bolts affixing the registration plate to the vehicle. It was not apparent why their system sometimes could, and sometimes could not cope, or why their 19 checks failed to pick this up in the first place, or why they had no fail-safes built into the system to report and check on mismatches. Currently the DVLA have no system which can stop giving keeper details out on a car park by car park basis, so they will continue to supply keeper details for this car park even though the ANPR equipment is prone to false readings. 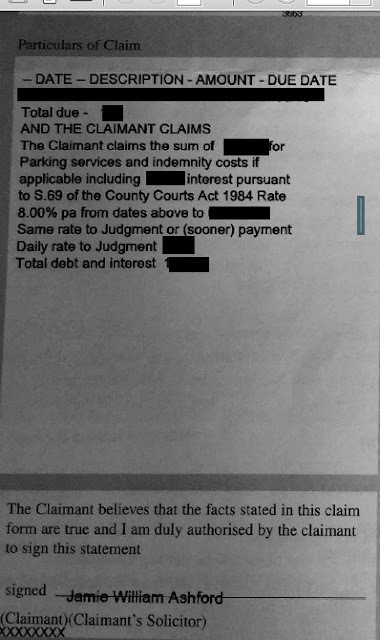 ParkingEye have previously admitted in court documents that they issue 65% of tickets in error and have to cancel them on appeal. A further 47% are then cancelled by the appeals service POPLA. Following that, another 50% are cancelled in court hearings. With so few tickets being issued correctly it is time for the DVLA to step in and change their systems. Once a car park has been identified as having an issue, all ticketing should cease and the DVLA should stop providing keeper details until the problem has been resolved. ParkingEye have not heard the word on the street. Another claim cancelled. ParkingEye have apparently not heard the word on the street that the Supreme Court will rule in their favour on October 21, as they have discontinued another claim. The Prankster first reported on the claim in May, when it was stayed to await the result of the Beavis Appeal. 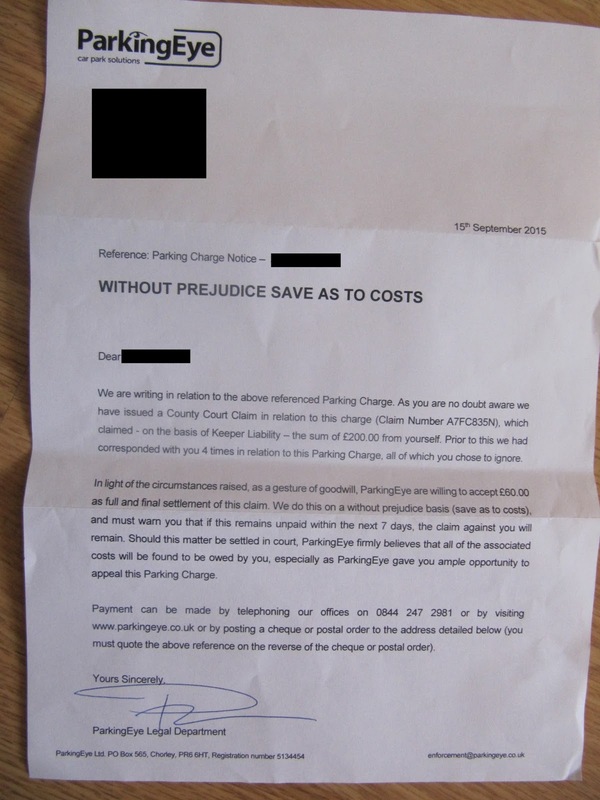 ParkingEye then wrote to the defendant on September 15th, offering to settle for £60. Seven days later they wrote again, cancelling the charge. The defendant had previously informed ParkingEye that they were not the driver and that the driver lived in the UAE. ParkingEye replied that as they could not chase the driver they would take action against the keeper instead. They also lied to the court in the first hearing, stating that no contact had been made by the defendant. The defence was based on the level on parking charge being too high, and that the keeper was not the driver and ParkingEye had previously been informed of this. The Prankster presumes that the 'word on the street' was actually planted by ParkingEye's representatives, LPC Law, in a hope that cases would not be stayed until the Supreme Court verdict. The Scottish Parliament debated unfair parking charges. The full report is here. MPs, and Citizens Advice Scotland reported a vast increase in the number of complaints regarding private parking charges. Although it was agreed landowner rights needed to be respected, the common consent was that the balance had tipped too far and aggressive practices were being used to milk the motorists out of money. Most of the complaints were down to 15 rogue firms. 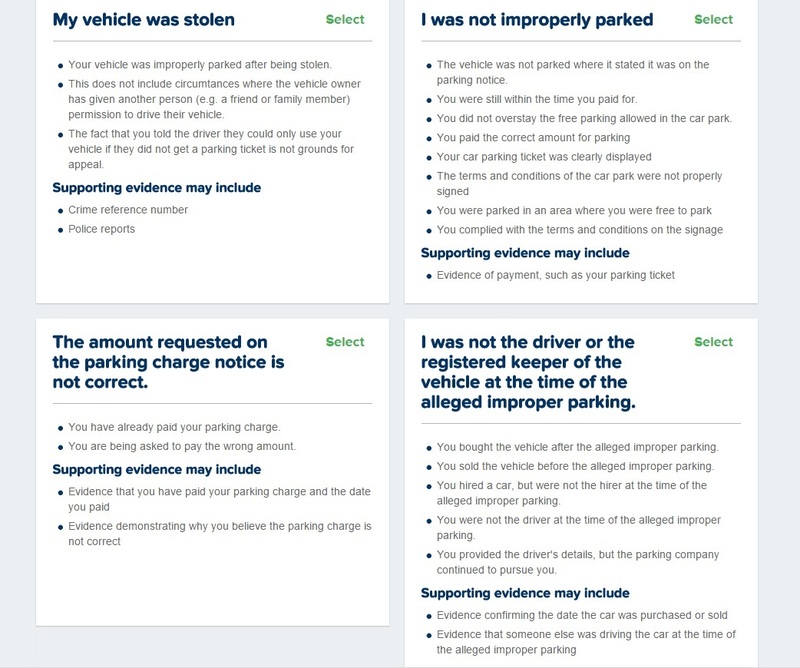 Although these were not mentioned by name, The Prankster will hazard a guess that ParkingEye, CEL, Smart Parking, Excel Parking, Vehicle Control Services, UK Parking Control and UKCPS were the main culprits. These companies all use the dodgy tactics highlighted in the debate. Particular emphasis was put on bad signage, excessive charges and impersonation of council charges. It was also noted that a whistle-blower from Smart Parking explained that a controversial new system in Kinnoull Street, Perth was introduced with the sole purpose of driving up parking charge revenue. A very telling comment was made by Derek Mackay, The Minister for Transport and Islands. If companies kept to the code of conduct and companies acted ethically and responsibly I would have more comfort. Every member so far has given an accurate appraisal of how their constituents have been affected, which is why we must look closely at what Parliament will be able to do. As minister, I want to send a strong message. We need clear signage and a fair and consistent approach that treats people reasonably. We need companies not to pretend that people have breached the law and for them therefore to face all sorts of penalties should they not comply. Fines should be capped at a reasonable level and the CAS guidance should be acknowledged. We will move forward to ensure that people are treated more fairly, which is the essence of the CAS campaign. As a Scottish Government minister I cannot say, “Don’t pay the fine.” It would be irresponsible of me to give that message. However, if people check their legal rights and responsibilities, many will realise that they have not breached what they think they may have breached. My advice is that people should check their rights, check the law, seek representation and do the right thing. The Scottish Government will take on board all today’s comments and convey them to all the operators. We will strive for a fairer, more transparent and more reasonable approach, so that no one is unfairly charged to the point at which they are being caused anxiety and financial loss. A thread on MoneySavingExpert is reporting that UK Parking Control have been suspended from DVLA access. The motorist won their POPLA appeal because UK Parking Control did not show authority to issue tickets. This is commonplace with UK PC, and most POPLA appeals against them are won on these grounds. 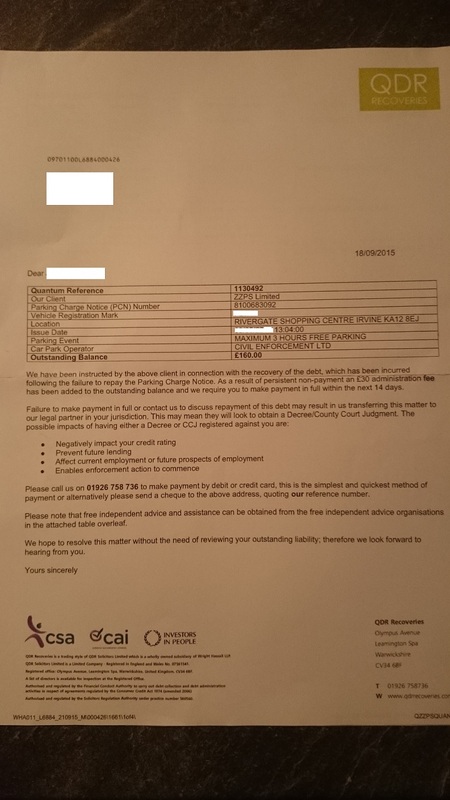 The motorist then complained to the DVLA that they were giving out keeper data to a company which on the face of it, did not have authority to issue charges. The DVLA replied that they could not comment on the POPLA decision, but that UK PC were suspended anyway. Thank you for your recent email regarding release of data to UKPC. Unfortunately I cannot comment on the POPLA decision but I am however, able to confirm that UKPC no longer get vehicle keeper data from DVLA. If you require any further information please feel free to contact me. At this point in time there is no information on when the ban started, why the ban was imposed and how long it will be in place for. DEAL turn up in court, but bottle it. Beavis to lose on 21st October. The Prankster helped a defendant prepare a suitable witness statement and defence regarding a DEAL case. Here is the defendant's report, along with surprising revelations about ParkingEye v Beavis from the judge. I arrived at York County Court quite nervous at around 11 for my 11.30 hearing. I was hoping this would be another “no-show” by DEAL but my hopes were dashed at 11.20 when a smartly dressed lady came into the waiting room, walked over to where I was sitting with my wife and asked if I was the defendant. I must admit my heart sank a little when she introduced herself as the solicitor who would be appearing for DEAL – I’d prepared well and got my arguments ready, but I still wasn’t looking forward to crossing swords with a trained solicitor in front of a judge. The solicitor then asked me if I’d done this before. When I said I hadn’t she ran through how the process in the courtroom worked. She asked me to confirm that my argument was that the “fine” was unenforceable, and I said that was one of my arguments, but I had several others. She looked a bit less confident when I said this, and asked if I knew there was a case being reviewed at the Supreme Court on the “unenforceability” argument, and her face dropped a bit further when I said I did, assuming she meant ParkingEye v Beavis. I got the definite impression (as did my wife who was sitting next to me) that she was fishing to see how much I’d looked into it and prepared to defend the claim. The solicitor then told me she hadn’t got my witness statement, and had I prepared one. I replied that I had (based on the template you kindly supplied me at short notice – thanks again) and that I’d sent it to York County Court and DEAL on the same day, so they must have received it. She replied that they hadn’t supplied it to her, and asked me what my other arguments in court were going to be. I replied that that was surely something that we should go over in court, not in the waiting room, and she confirmed that I wasn’t obliged to tell her what my arguments would be. I said ok then, I won’t. She looked at her notes and then stated that what she’d decided to propose was a “discontinuance of the claim”. At this point I thought “Oh here we go again, she’s going to say that if I’ll pay £215 here and now we don’t have to go into the courtroom”, but no, it became apparent that she was offering to drop the claim completely as long as I wouldn’t push for costs. I was very happy with this outcome to be honest, although I tried not to show my delight. I agreed that this would be fine. She said we’d only be in the courtroom for a couple of minutes while she explained to the judge what we’d agreed. A couple of minutes later we were called in and after we’d sat down the judge began a preamble, confirming the details of the claim as he understood them. When he finished speaking the solicitor for DEAL said that she’d had a conversation with me and we’d agreed that DEAL would discontinue the claim and I wouldn’t claim costs. She rationalised this on the basis of she didn’t want the case to be stayed until after Beavis and for us all to have to reconvene at a later date. She then stated that as DEAL hadn’t applied in advance for a discontinuance she was actually requesting that the judge dismiss the claim at this point. He looked a bit surprised and went over what he understood she wanted him to do, outlining the alternative that we could have the hearing and stay judgement until after Beavis if necessary. I was getting uneasy now as it sounded like he was trying to change her mind, but as she and I had agreed not to continue I didn’t know if he could actually do this or not. Anyway, he explained to me what the discontinuance meant, and confirmed that he would dismiss the claim as requested by DEAL’s solicitor. As we got up to leave the judge said he would like to go through the details of the DEAL claim with their solicitor, as he said had there been a hearing there were some things he would have seriously struggled with. He outlined various points, including one I’d picked up when I was preparing to defend the claim, which was that Ashley Cohen’s first paragraph in his witness statement is that he’s authorised to speak for CEL. As the judge said, CEL were not a party to this case, so this, and presumably the rest of what Mr Cohen had said in his statement, was therefore irrelevant. Moreover he didn’t think it was a witness statement, all that was in it was information he must have been supplied with by DEAL (not sure if this was right or not). He then questioned the relevance of an assignor/assignee agreement from 1st July 2014 which they had included in their bundle of documents. This had no relevance to my specific case, as it had been assigned before this agreement. 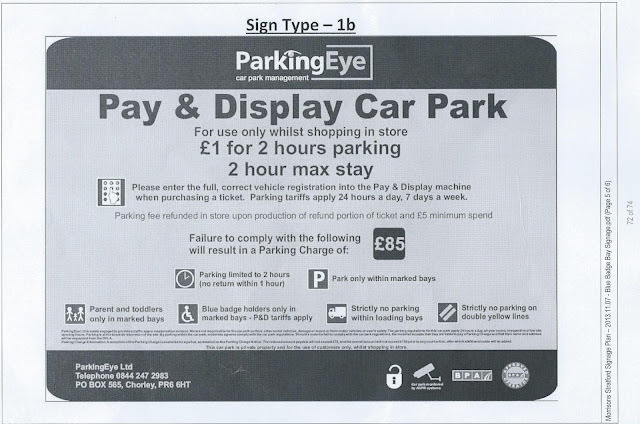 Also DEAL had never provided any proof of signage (although I noticed that the solicitor had brought along a photocopy of a sketched plan of the car park with signage marked on it). He commented that he thought in the circumstances that the judgement we’d agreed on (ie dismissal) would have been the appropriate one. One word of caution he did give me though, was that, as he put it, “the word on the street” is that the Supreme Court will not change the decisions made in the Beavis case by the lower courts. He also said his understanding is that the judgement will be given on 21st October. His final words to me, in the context of the Beavis case, were that he thought I was quitting while I was ahead, which he thought quite sensible. Overall not a pleasant experience (though the relief and sense of achievement when I realised DEAL weren’t continuing with their claim were fabulous feelings), over three years of harassment, nasty letters and mounting amounts supposedly owed with each letter. At times I wondered if it wouldn’t have been better to pay up early on, but, with support and advice from websites like yours and others, I never considered caving in and paying, and I’m really glad I didn’t. Given that the solicitor did turn up, and had brought evidence along with her (such as the signage plan of the car park), I can only assume that they were planning to continue, or hoping I didn’t turn up. Once I had, and they realised I had a decent defence (or didn’t know the strength of it given that they hadn’t supplied the solicitor with my witness statement) that would at least make them doubt the certainty of their success in a hearing they obviously calculated that the odds weren’t necessarily in their favour. I’m sure they do the same thing all over the country. I actually felt a bit of sympathy for the solicitor (although obviously not too much as I’m sure she was well paid for her day in York!) as I got the impression that she hadn’t had any involvement with the claim at all up to the hearing, but she had to sit and take the flak from the judge about the quality of their case. She told me afterwards she’d come from Leeds, so I guess DEAL must retain solicitors dotted around the country and just send along the one nearest to the court where the hearing is being held. Anyway, she was quite friendly and professional before, during and after the short time we spent in court. The judge too seemed friendly and personable, not really what I was expecting. Anyway, thanks again for the documentation you sent me, although it was never heard in court I think the very fact that the solicitor realised I had submitted a witness statement probably swung her decision on their best course of action, and even if it didn’t, it did mean that I went in there far more confident with my preparation than I would have been without one. Best wishes, keep up the good work and I hope things don’t change for the worse after the Beavis judgement. The 'word on the street' may or may not be correct, and in any case the devil will be in the details - how many of the seven judges ruled for each party, and what the exact points of law were. 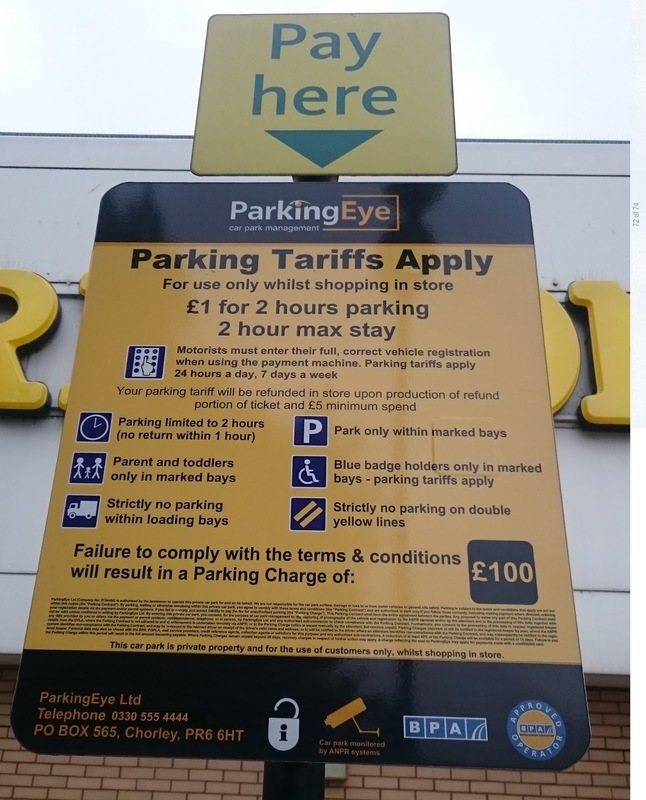 A result for ParkingEye will legitimise the practices which lead to the kind of fraudulent behaviour shown recently by the likes of UK Parking Control. 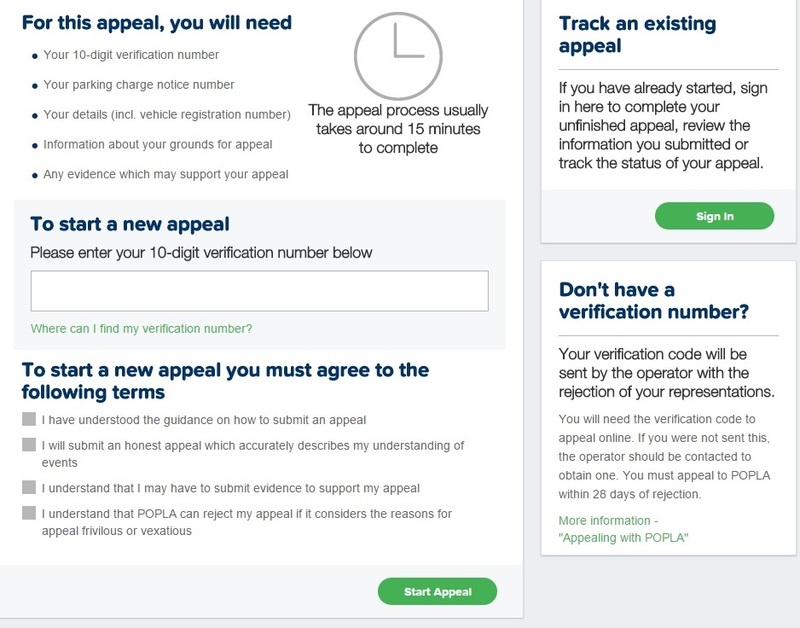 It will drive the aggressive enforcement practices championed by the likes of ParkingEye, such as entrapment zones, designed to fail guess-on-exit systems, providing false information to the court and driving away customers to the detriment of retailers. They will reinforce dodgy business relationships such as between Gladstones Solicitors and the Independent Parking Committee and lead to the creation of ADR Entities such as the IAS which do not obey the legislative requirements and are therefore no more than kangaroo courts. The Prankster will therefore wait and see what the actual verdict is. 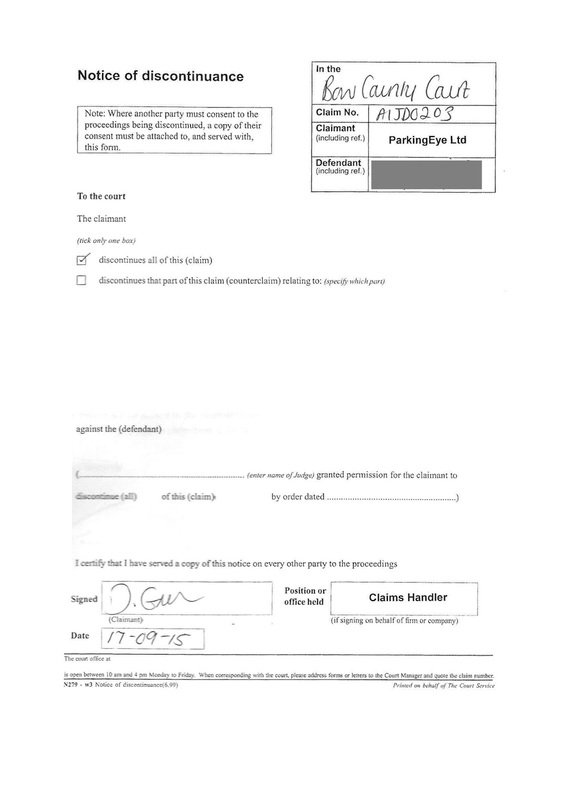 ParkingEye's blundering legal team have yet again filed a claim when no contravention occurred. 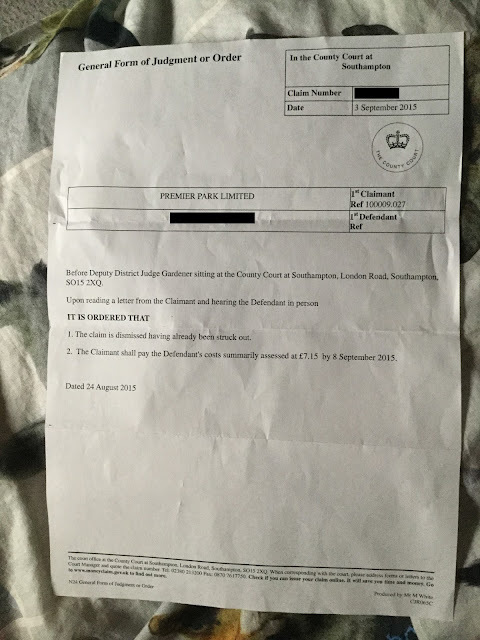 The Prankster does not know whether the claim was filed by Rosanna Breaks or Rachael Ledson but it is now increasingly apparent that no actual checking goes on when claims are filed, and as these are done electronically with no obvious human checks, then no solicitors filing fee has been occurred. The £50 solicitor's fee has already been struck out in at least one claim. The full story is on Pepipoo. 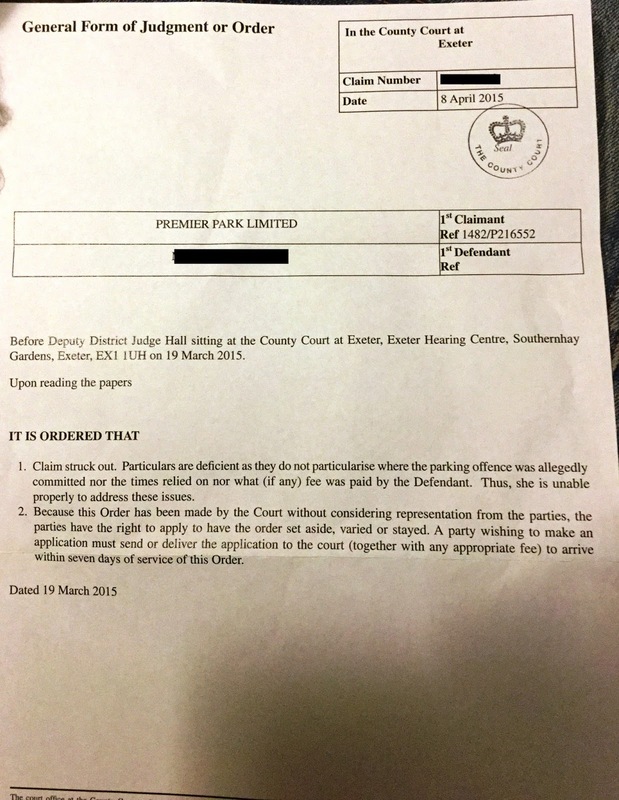 ParkingEye initially got a default judgment and then a CCJ against the motorist by the common parking company tactic of writing to the wrong address - a house where the motorist once lived. Once they obtained the CCJ they then used a tracing agency to find the correct address, and attempted to enforce the judgment. 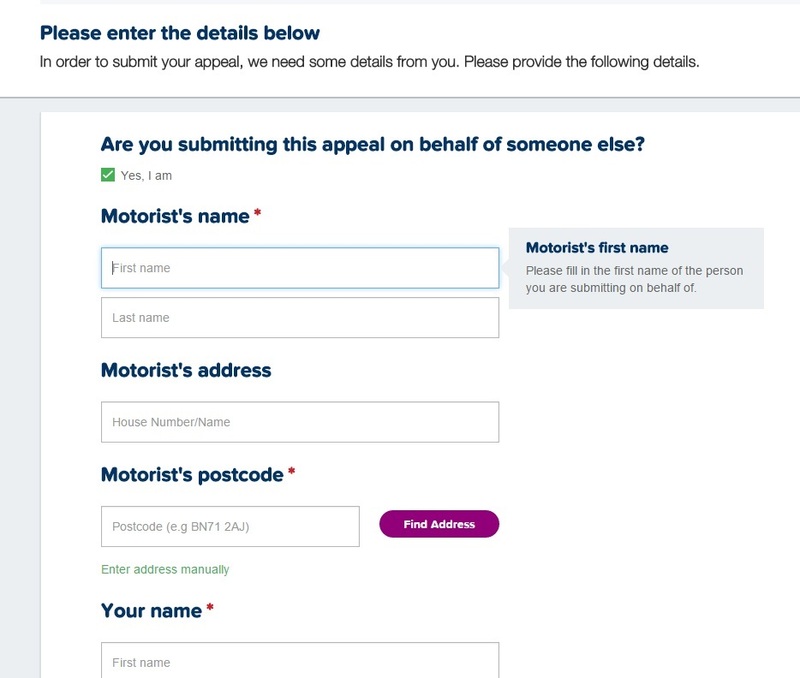 The reason the wrong address was used was that when the motorist attempted to update their address, the DVLA lost the letter and their records were never changed. Technically the motorist should have checked with the DVLA after receiving no reply. Although the motorist was in theory at fault for not updating his address with the DVLA, this does not excuse ParkingEye. If no replies have been received to any letters, it is industry best practice to assume that the address may be incorrect, and to use a tracing agency to confirm the address before issuing any court claim. 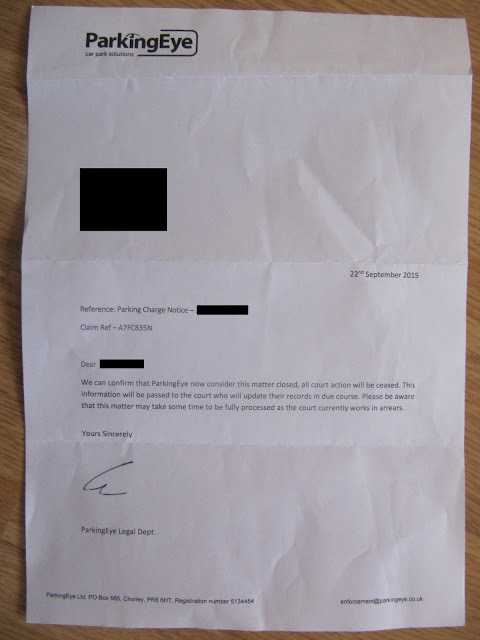 Up to the point of using a tracing agency parking companies have had no confirmation the address they are using is correct, or even that the car belonged to the motorist at the time. The DVLA can take up to 6 weeks to update vehicle data and so the parking companies have no grounds for believing their data is correct. Data obtained from the courts show that in November 2014 around 1 in 3 ParkingEye hearings was a set-aside request, showing that this is a sizable problem. Having a CCJ against your name can cause serious financial repercussions, including house purchases falling through and not being able to get a mobile phone contract. As ParkingEye are well aware of the problem, especially given the number of set-asides which occur, then any motorist who has lost out financially due to their actions may well have a case against them. 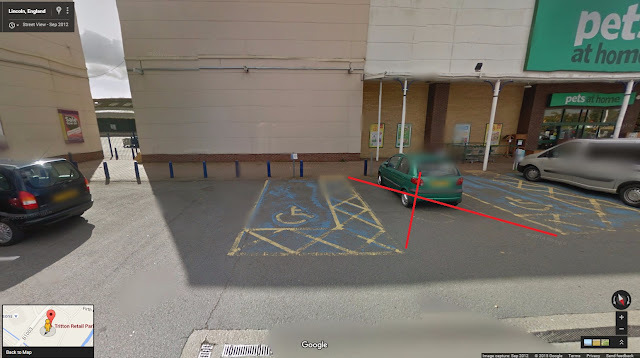 In this particular case ParkingEye were acting as agents for Morrisons, so the motorist may also have a claim against Morrisons. The motorist requested a set-aside hearing. ParkingEye filed a barrage of nonsense, claiming there was no good reason to allow a set aside. In the set aside hearing the judge disagreed, and ruled the motorist had a case. The set aside was granted. In this particular car park, there is a maximum stay of 2 hours, for which a charge of £1 is made. This is refunded in store if more than £5 is spent. Parking charges are issued for staying over 2 hours, returning within an hour, parking on yellow lines, parking outside a bay, parking in a loading bay, parking in a parent and toddler bay without a toddler or parking in a disabled bay without a blue badge. 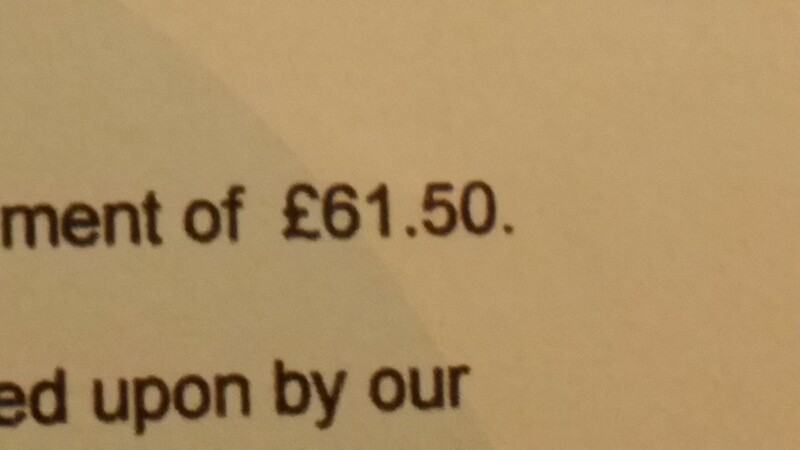 The motorist was charged £85 for staying 1 hour 27 minutes. A careful examination showed that this is not a contravention which results in a parking charge. The motorist duly pointed this out when they filed their new defence. 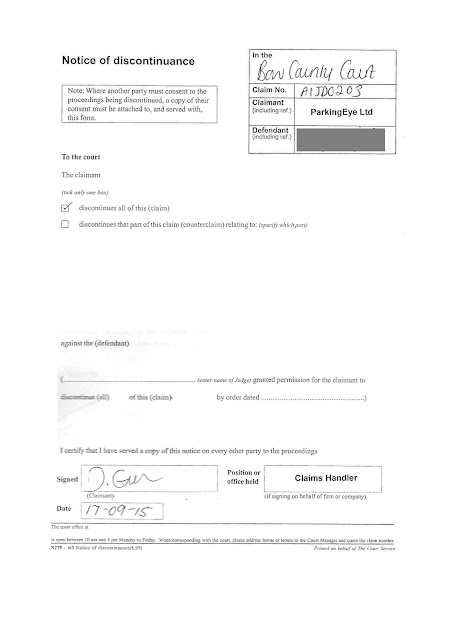 In the Claimant’s Reply to Defence dated 24th April 2015, they provided a site map and copy of the two signs present at the car park setting out the terms of the contract (enclosed). The two types, 1a and 1b, have the same wording. If this sign does form a contract with the driver, as claimed, then it does not allow the Claimant to charge £85 if a driver parks for 1 hour 27 minutes without paying £1. The use of the phrase “Failure to comply with the following” means that I have not breached this alleged contract in any way. This alleged contract only allows the £85 charge if I had parked longer than two hours, and the Claimant already stated I only parked for 1 hour 27 minutes. 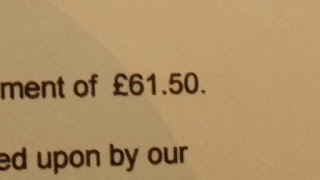 If they wanted to charge £85 for failing to pay £1, this should have been clearly listed below the phrase “Failure to comply with the following”. But this term was not included in the alleged contract. ParkingEye will have been well aware that at this point they had no case. Several judges have already ruled that this type of wording means that no contravention has occurred. The cases of ParkingEye v Lemon and Harris and ParkingEye v Collins-Daniel are both excellent examples of this, and the transcripts should be required reading for anyone facing this situation. 7(2) If there is doubt about the meaning of a written term, the interpretation which is most favourable to the consumer shall prevail but this rule shall not apply in proceedings brought under regulation 12. As two judges have already found doubt about the meaning of this type of signage, it is not open to other judges to state there is no doubt. (Therefore the transcripts for the above cases should be taken to any hearing). ParkingEye sneakily offered the motorist to settle the claim for £60. The motorist refused the offer and ParkingEye then pulled out, discontinuing the claim. It should be noted that ParkingEye are well aware of the problem with their signs and changed them some time ago, a fact which the motorist also pointed out in the defence. Now that ParkingEye have dropped the claim, the motorist should claim for their set aside fee of £155 and also for loss of work in attending the set-aside hearing. 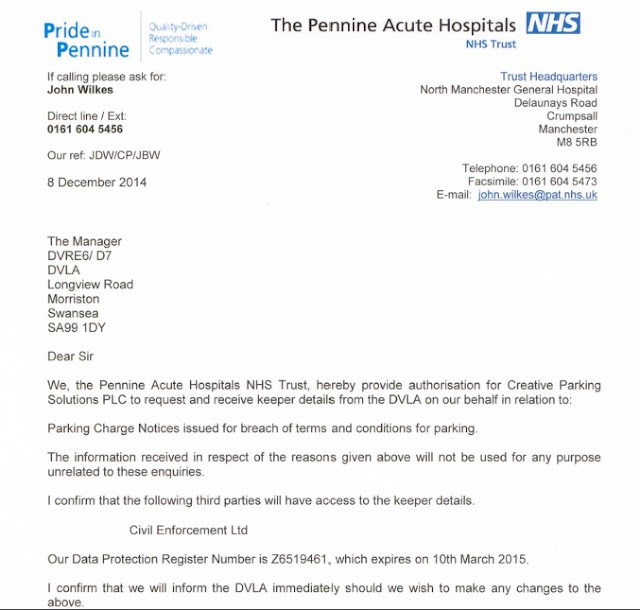 Pennine Acute Hospitals appear to have a parking contract with a dormant company, as this FoI result shows. 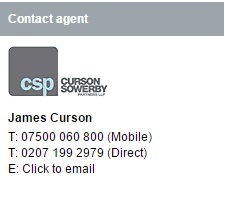 Creative Parking Solutions PLC are a dormant company according to Companies House. They of course should not be confused with Creative Car Park Ltd, or Creative Parking Limited or Creative Technologies and Systems Limited. All 4 companies share the same address, St Nicholas Close, Elstree, Borehamwood, WD6 3EW. They also have similar, but different, mixes of directors. No doubt Pennine Acute Hospitals know what they are doing and who they actually have a contact with. However, it is notable that Civil Enforcement Limited lose most POPLA appeals because they cannot prove they have authority to issue parking charges. A second motorist has stated they were fraudulently issued a ticket at Digilis, Worcester. The case is reported in the Worcester News. The photographs claim the car was parked at 19:36 on December 19th 2014. 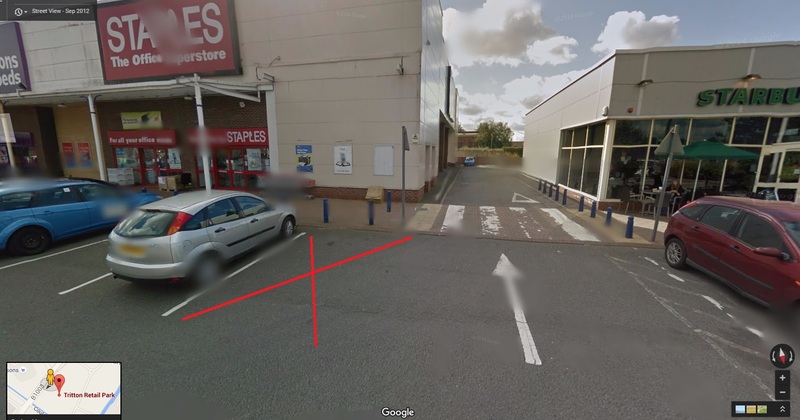 However, the driver, Steve James was at work at Tesco, St Peter until 8pm and accessed CCTV to prove this. Mr James appealed but was told " the time stamps cannot be altered". POPLA also failed to uphold his appeal. Mr James refused to pay the charge. This is the earliest confirmed case, although there is an unconfirmed case dating back to 2011 and the earlier fraud trial of UK PC. In that trial it was reported that UK PC issued Joan Clark of Gilberdyke a ticket, wrongly claiming she had parked more than 2 hours. It is not known whether the photographs in that particular case were doctored. The number of incidents and car parks keeps increasing, as does the the time over which this fraud has been perpetrated. In order for public confidence in the car parking industry to be restored, UK PC now need to open their systems to an independent audit team so that a full investigation as to the scope of the fraud can be made. The public then need a list of car parks, warden numbers and timescales to be published. The public also need to know whether all these wardens independently discovered the scam, or whether information was passed between wardens - and if so, how. Anything else smacks of a cover up. CEL are known for issuing claims which they variously claim are contractual charges, charges for breach of contract or charges for trespass. It it clear at least that older claims are for breach of contract although they have now updated their signage and it is currently a matter for dispute. In general claims for breach of contact must match the losses incurred by the injured party, so a valid question is, just how much do CEL lose when they issue a ticket. The immediate answer is of course nothing. However, they do then start to lose money due to the issuing of the ticket itself. CEL do not usually have a direct contract with the landowners themselves. Contracts are issued through their sister company Creative Parking. This helps keep a respectable distance from the murky actions of CEL and the actions of Creative. CEL can be viewed of as a disposable shell which can be phoenixed if any problems occur, while the other company, Creative is carefully kept out of the news and squeaky clean. 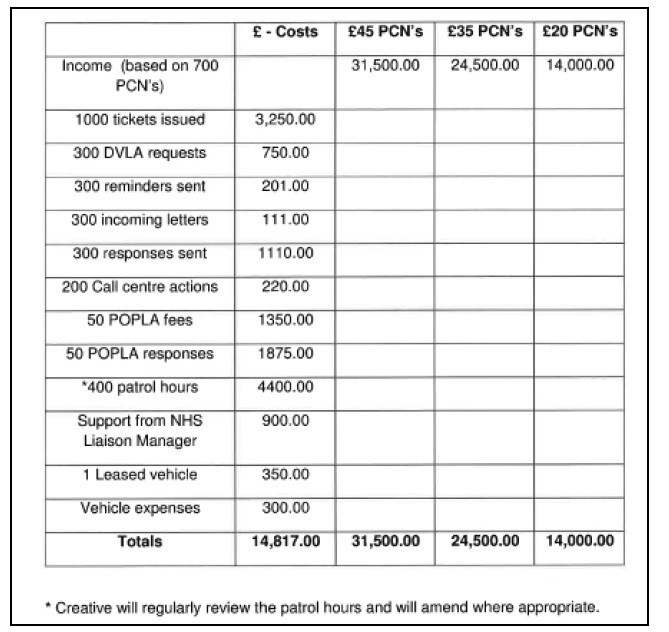 A useful guide as to how much a ticket costs Civil Enforcement Limited/Creative Parking comes from this FoI request. 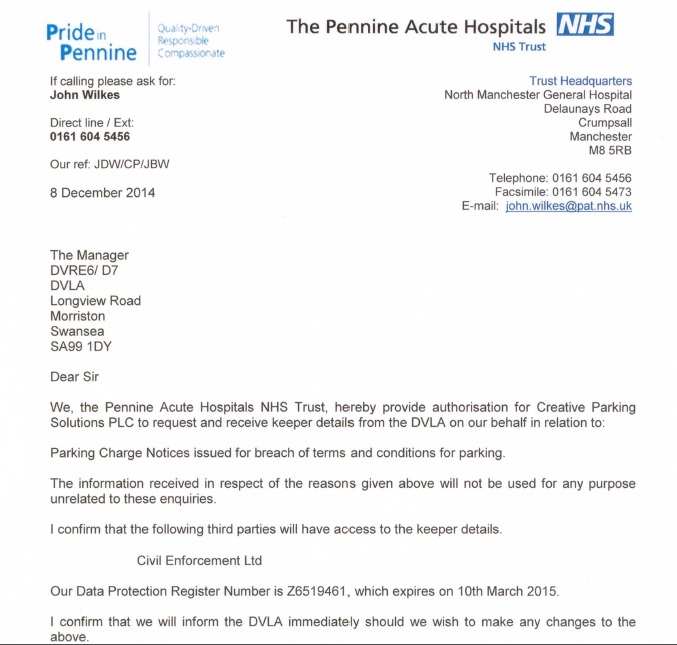 Creative have a contract with health provider Pennine Acute Hospitals NHS Trust where they enter a revenue share on parking charges issued. Costs are deducted on an open book basis, and the remainder then shared between the trust and Creative on a 20%/80% split. At this site CEL set the charge level to £70, so if a charge is paid on issue of a PCN then the profit is around £66. If the charge is paid on issue of a notice to keeper, then profits drop to around £63 per ticket. It is only if a motorist appeals, and in particular appeals to POPLA that profits drop. 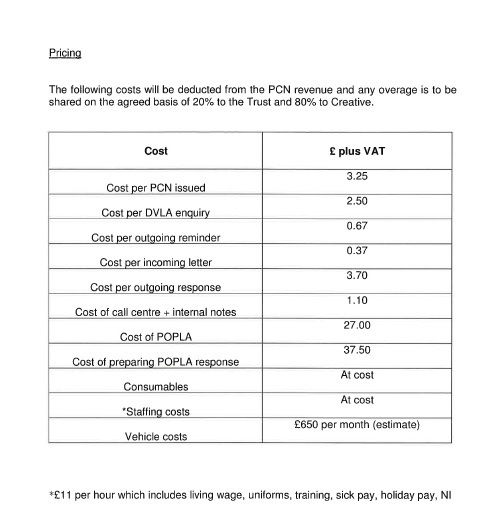 Creative give the Trust a handy guide to the levels expected for the various costs. Charges such as patrol hours, NHS support, and vehicle costs are general running costs of car park management and cannot be attributed to losses incurred by motorist breaches. The expenses directly incurred as a result of 1,000 breaches comes to 8867. The average cost per breach is therefore £8.87. The charge of £70 is therefore clearly extravagant and unconscionable, and moreover is in breach of the government guidelines on hospital parking contracts which forbid contracts which incentivise the issuing of tickets. The new POPLA process differs significantly from the old process. The appeal and evidence must be filed all in one go, and you cannot alter or add details later. You must also agree to 4 terms and conditions. Next you choose the reasons for appeal. As well as the 'traditional' 4 reasons you can also chose 'extreme circumstances or 'other'. 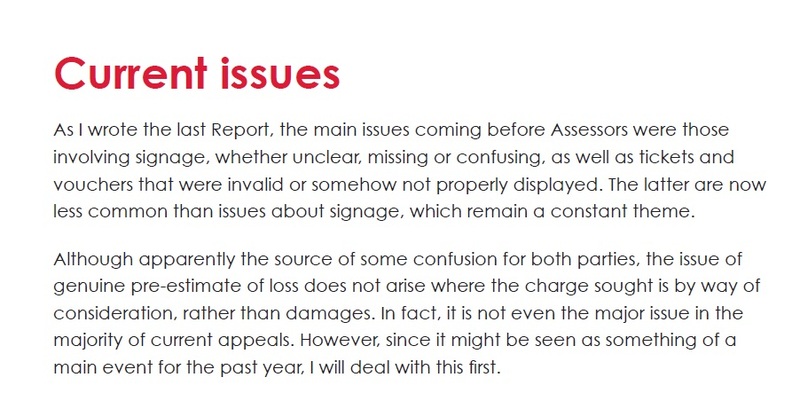 Despite featuring heavily in the 2015 POPLA annual report, it appears appeals on the grounds of bad signage or ticket display issues, or the issue of genuine pre-estimate of loss are not possible in the new system (except under the other category). Neither are appeals on the basis that the operator is breaking Consumer legislation, or that the operator had no contract with the landowner or that the requirements of POFA 2012 have not been complied with. ...although all is made clear on the next screen which allows sub-categories which had not appeared before. However, some categories are still missing. Next you fill in your details, such as name and address. If like The Prankster, you are appealing on behalf of someone else, this is allowed too. You also fill in the parking charge number and vehicle registration. If you do not possess a telephone, tough luck, as this is a mandatory field. The Prankster found that 11111111111 seems to work fine. There appear to be some teething troubles with postcode lookup. Using the 'Find Address' button always caused an application error. However, the 'Enter address manually' option worked. The next step is to enter detailed reasoning and evidence for all the options you checked. You then get to check and review you appeal (at which point The Prankster noticed he had failed to attach the evidence). 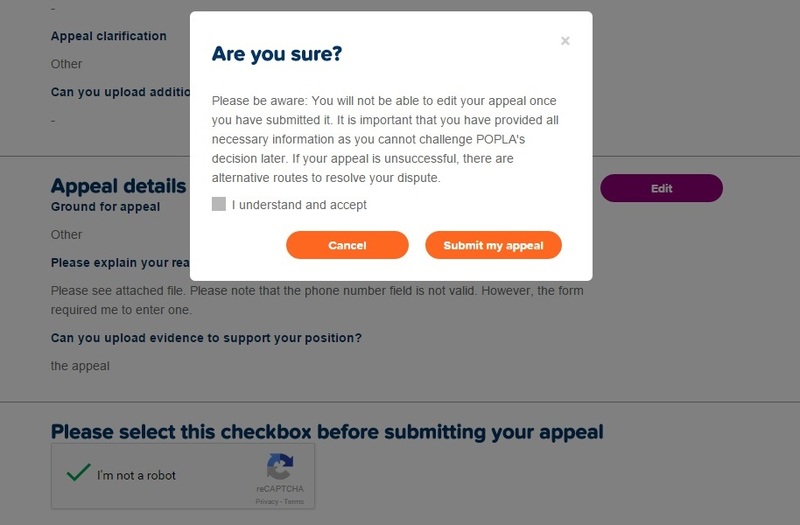 After declaring that you are not a robot, you finally submit the appeal. After tis point, your appeal cannot be edited. THIS IS AN IMPORTANT DIFFERENCE TO PREVIOUSLY. POPLA will now email you a password. You can use this to track your appeal. However, you cannot see what you actually appealed, or change it. It is also not clear if you can see and rebut the operator's evidence. The new site allows you to track the progress of your appeal, and find out if the operator has submitted evidence. This should hopefully reduce procedural complaints, most of which were to do with evidence not being received, or different evidence being sent to POPLA and motorist. The new POPLA will accept appeals based on mitigation, but explain that as they can only refer such cases back to the operator, mitigation is not likely to be successful. The new POPLA will also take into consideration failure to comply with the code of practice. At this point, it is not clear what 'taking into consideration' actually means. 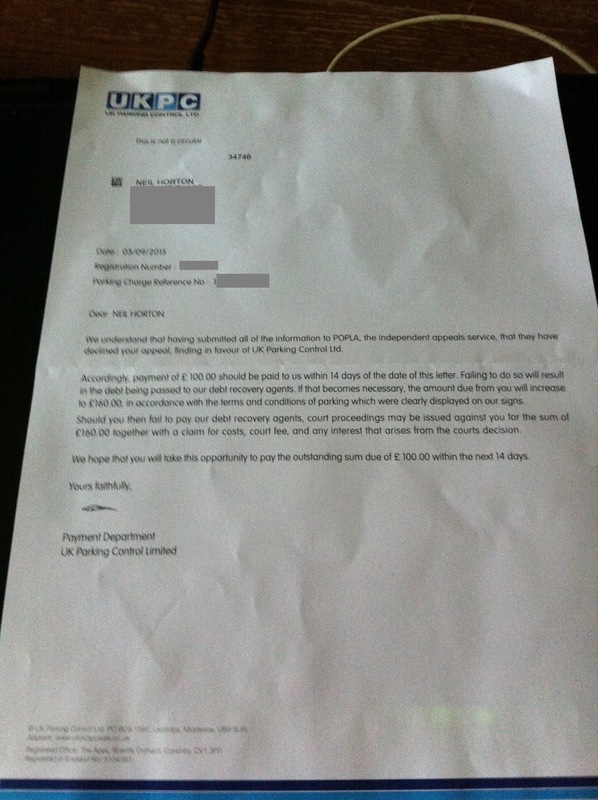 UK Parking Control have begun refunding victims of the timestamp scam. The first motorist to receive a partial refund was Jade Beeby, who was ticketed for £60 even though she was elesewhere enjoying a birthday breakfast at the time. Jade is due to be refunded £61.50, as she paid by card and a £1.50 surcharge was added. 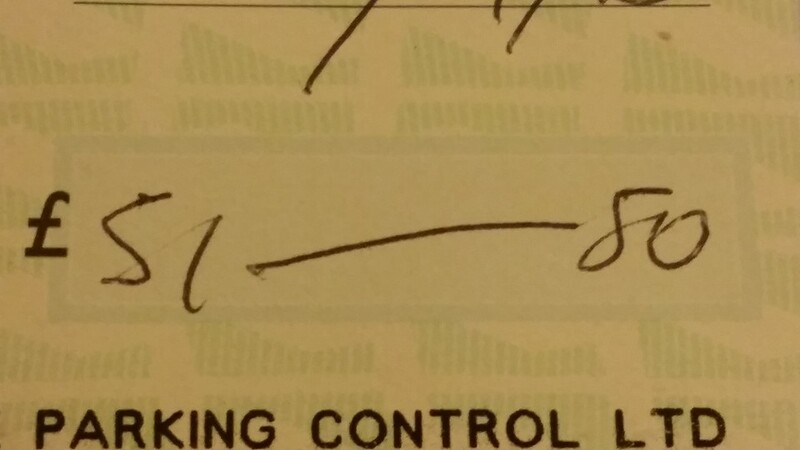 UK Parking Control confirmed this in the above letter she received. At this point in time there is no indication of when UK Parking Control will have enough cash in hand to allow them to to refund the remaining £10. Gladstones managed to get double fees out of hapless operator Premier Park. Gladstones operate a no-frills claim filing system where they file anything the operator provides without checking that there is any validity to the claim, if the details make sense, or if the particulars are sufficient to allow the defendant to defend the claim. Premier Park decided to use them to pursue a parking charge and Will Hurley filed the first claim. The claim was duly struck out by DDJ Hall at Exeter for not containing enough information in the particulars of claim. Not satisfied with gouging Premier Park once, Gladstones tried again. The claim was refiled, this time by Jamie Ashford. The claim was of course struck out a second time. DDJ Gardener at Southampton, struck it out as it had already been struck out once. The Prankster recommends that parking companies wishing to file a claim select a solicitor who knows the law. 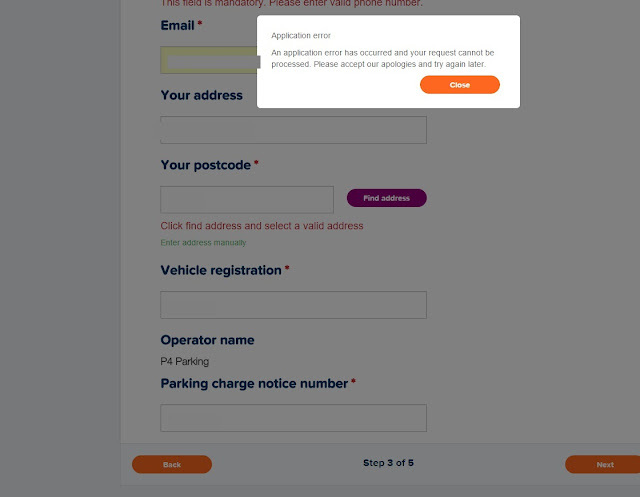 Although UK Parking Control have issued a statement explaining that they would be refunding victims of the timestamp fraud, they appear not to have informed their payment department. Neil Horton, one of the victims in Sheffield, today received a demand to pay £100 following POPLA's failure to adjudicate in his favour. Although the letter is dated 3 September it was received today, 12 September, suggesting it was posted either Thursday 10th or Friday 11th. Incorrectly dating letters is a common parking company trick. The letter gives 14 days to pay from the date of the letter, which expires on Thursday 17th. This puts extra pressure on motorists. A report in the Worcester news suggests the UK Parking Control timestamp scam has been going on since at least February 2015. The incident happened in a car park in Diglis, which if substantiated means at least 3 wardens and car parks are implicated. The photographs appear to show the car parked at 2.13pm. However the victim, Mrs Gashi, only arrived at about 4pm and was in Powick prviously with her parents, who can vouch for her and her car's whereabouts. "date and time stamps on its equipment cannot be altered." "On a balance of probabilities I am satisfied that the vehicle was parked on site at the times stated on the operator's photographs." The police were asked to investigate, but declined, stating it was a civil matter. Yesterday an ex-UKPC warden explained how some bays at Tritton Retail Park were used as cash cows. 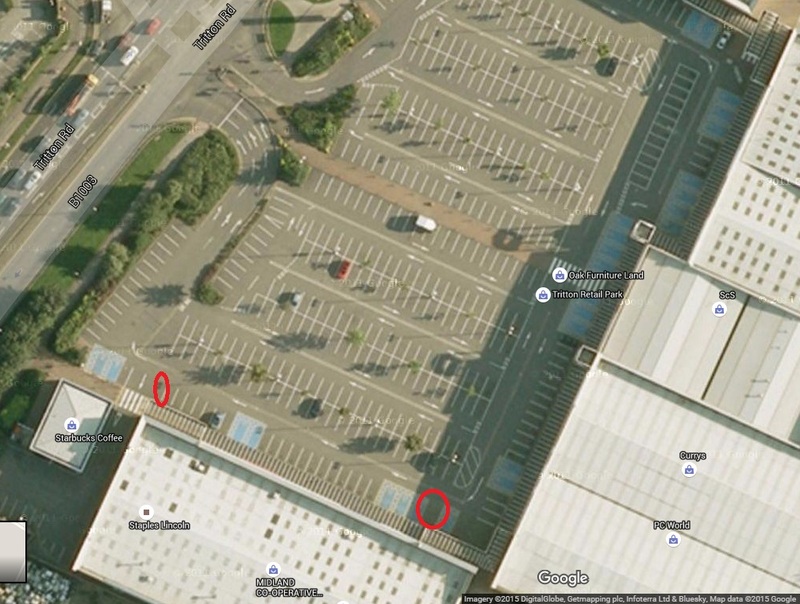 “On this site there are two parking spaces which are not actual spaces, even though they are marked up as bays, a lot of tickets were issued in these spaces to get numbers up (and probably still are). “The end bay outside Staples, another bay between Pets at Home and PC World, were used as (cash cows), no signage to say these were not bays. You can understand why cars should not park in the leftmost space; parking at the end of Staples would make it difficult to get down the access road. The reason for not allowing parking by Pets at Home is less clear. Perhaps it is to do with disabled parking. For all intents and purposes, it does appear that where the green car is parked is a legitimate space..
Whatever the reasons the landowner does not want parking in that spot, this does not mean that the bays should be used as cash cows by parking companies. If motorists should not park there, the proper response would be to clearly mark this out, perhaps by using yellow crosshatches on the ground, and even a sign on the wall. This is a crucial difference between proper management of a car park, and using the car park as a cheap source of money. Trinity Retail Park is managed by LaSalle investment management, and the contact agent is James Curson (james@cspretail.com). The Prankster calls on Mr Curson to organise proper marking for these non-bays. The Lincolnite has been contacted by an ex warden to explain how the parking scams work. “This was one of my former sites I used to cover, being an ex employee of UKPC. “When they take you on, you are on a KPI scheme. For 20-30 tickets it’s £2 a ticket, 30-40 £3 and so on, however in real world terms, in this car park (Tritton Road) that’s big ticket numbers. “The push for tickets on this site was unreal, I used to get calls, texts and emails at all hours of the day and night, constantly demanding more, more, more. “Photos often used to be taken at angles to make it look like people were parked really far out of bays, when they were not. “As for the time stamp fiasco, CCTV used to be checked first thing in the morning by the car park attendant. The questions which now must be answered by UK Parking Control are how long has this been going on for; is this going on with tacit approval of management; how will affected motorists be identified and compensated?